Tai Ji Quan is a major division of Chinese martial art. Tai Ji Quan means "supreme ultimate fist". Tai means "Supreme", Ji means "Ultimate", and Quan means "Fist". There have been different sayings about the origin of Tai Ji Quan. The traditional legend goes that the wise man Zhang Sanfeng of the Song Dynasty (960-1279) created Tai Ji Quan after he had witnessed a fight between a sparrow and a snake; while most people agreed that the modern Tai Ji Quan originated from Chen style Tai Ji Quan, which first appeared during the 19th century in the Daoguang Reign of the Qing Dynasty (1644-1911). 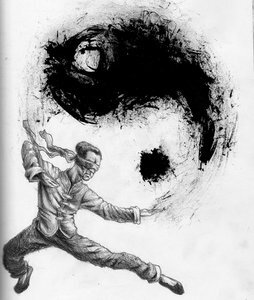 Tai Ji Quan has its philosophical roots in Taoism and is considered as an internal martial art, utilizing the internal energy, or Qi, and following the simple principle of "subduing the vigorous by the soft". Taoism is the oldest philosophy of China which is represented by the famous symbol of the Yin and Yang which expresses the continuous flow of Qi in a circular motion that generates two opposite forces, plus and minus, which interact and balance with each others to bring existence to the physical and metaphysical world. The most famous forms of Tai Ji Quan practiced today are the Chen, Yang, Wu, Wu and Sun styles. All the five styles can be traced back to Chen style Tai Ji Quan. According to historical records, Tai Ji Quan was founded by Chen Wangting (1597-1664), who lived in Chen Village, in today's Henan Province in China. Based on the Chen style and created by Yang Luchan, a Hebei native of the Qing Dynasty, the Yang style is now the most popular style worldwide. The Woo Style is based on the Chen and Yang styles and created by Woo Yuxing. The Sun style is derived from Chen and Woo styles and created by Sun Lutang. The Sun style is a combination of the more famous internal Chinese martial art forms of Ba Gua, Xing Yi and Tai Ji. The Wu style is based on Chen and Yang styles, and it was created by Wu Jianquan. Nowadays, when most people talk about Tai Ji Quan, they are usually referring to the Yang style, which has already spread throughout the world and is practiced by millions of people.